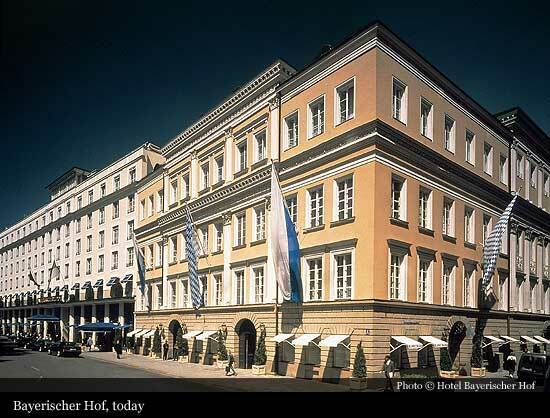 The history of the Hotel Bayerischer Hof begins in the year 1839. 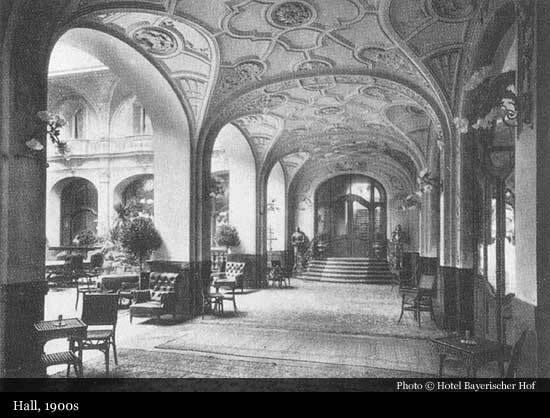 His Majesty Ludwig I of Bavaria expressed his desire that Munich should have a first-class hotel for distinguished travellers of high standing. The future “Reichsrat” and knight Joseph Anton von Maffei declared his willingness to take on this task. He purchased a guesthouse on Promenadeplatz and commissioned the architect Friedrich von Gärtner to build a new hotel on the site. 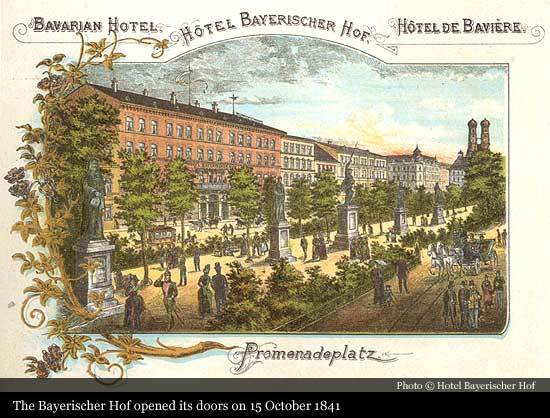 Just two years later, on 15 October 1841, the Bayerischer Hof opened its doors. The hotel was the smartest in town. So distinguished that its guests soon numbered not only foreign dignitaries, but even the king himself. Since his residence lacked a bathtub, twice a month he visited the Bayerischer Hof to take the royal bath. 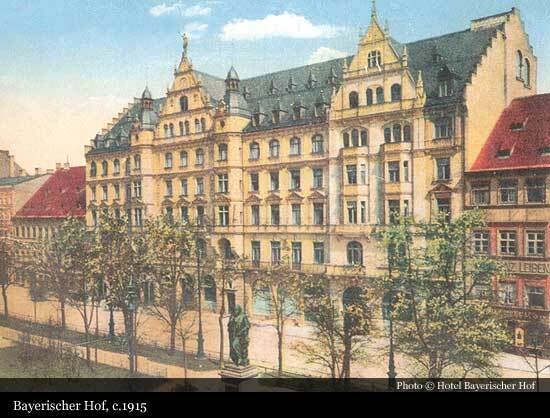 Herrmann Volkhardt acquired the Bayerischer Hof in 1897 for the princely sum of 2,850,000 gold marks. As successful confectioner and pastry cook, this was his second hotelier venture after the Hotel Fürstenhof. He had already created a sensation there that resounded far beyond Munich when he used electric lights to create festive illuminations in the rooms. 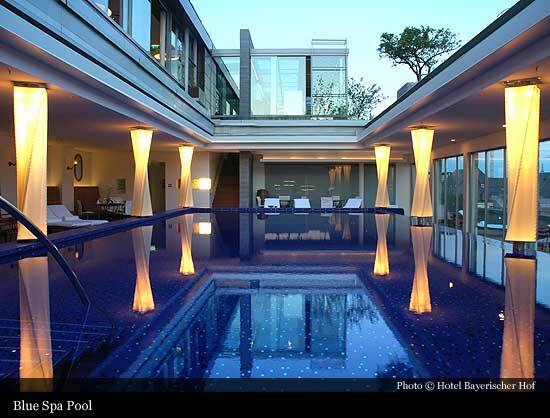 His ambition to create something special also went into the shaping of his new hotel. Despite the high purchase price, he immediately embarked on an expensive modernisation programme. At the same time, he could be sure of having a dependable regular guest even during the quiet winter season: the beautiful Empress Elisabeth of Austria. For a price of 60,000 gold marks, she rented two floors in the Bayerischer Hof all year round for herself and her 60-strong royal household. But it was in this very year that the unimaginable happened: on 10 September, 1898, in Geneva, the Empress was murdered. And shortly before he learned of the tragedy, Herrmann Volkhardt had put the final signature to the bill of sale for the hotel. Despite this event, which caused several financial difficulties, Herrmann Volkhardt was more than successful in clearing the Bayerischer Hof’s debts. 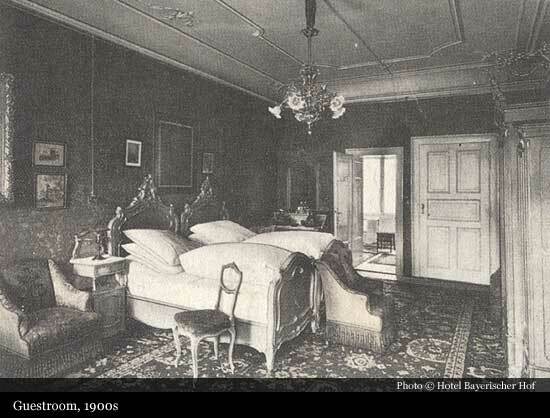 In 1901 he was even able to expand the hotel through the purchase of neighbouring properties. It now covered a site of approx. 5000 sq.m. In 1903 Herrmann Volkhardt founded “Volkhardt Wine Wholesalers”. In 1908 he transformed his self-built empire into the firm “Gebrüder Volkhardt”. His three sons Hermann (who wrote his first name with just the one “r”), Ernst and Wilhelm held equal shares in the new company. When Herrmann Volkhardt succumbed unexpectedly to a stroke on 24 December 1909, his succession was assured. Hermann, the second-oldest son, took over to become the second generation at the Bayerischer Hof. It was a serious responsibility, but one that he was now equal to. He had attended business school, learned the culinary arts and gained experience at other grand hotels abroad. He also frequented the house of Monsieur Breuilléde-la-Fosse, who later became the French Minister of the Interior, becoming known in the family as “the diplomat”. And it was just this diplomatic skill that allowed him to guide the Bayerischer Hof from 1910 through the difficult first half of the twentieth century. After the First World War, which disrupted the extensive modernisation work taking place in the hotel, the revolution of November 1918 brought the new Republican government to power. 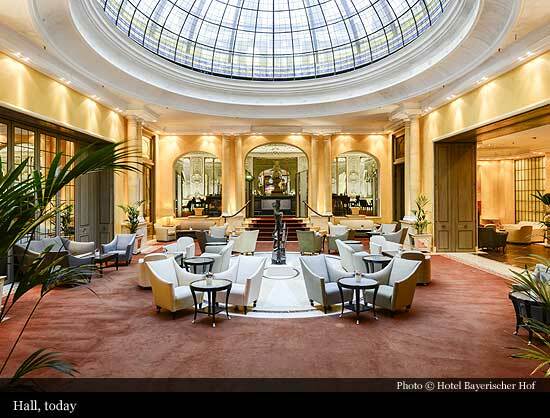 Which immediately wanted to commandeer the Bayerischer Hof for the new seat of government. But the revolutionaries, dressed in their martial uniform, hadn’t bargained for the overwhelming resistance of Hermann Volkhardt. Even when threatened at gun-point, he would not be moved: “I may be powerless to stop you seizing the hotel, but if you do so then you will be commencing your government with a grave injustice.” The hotel remained in his ownership, witnessing hyperinflation and then, from 1923, the “Golden Twenties”. Hermann Volkhardt married the opera and concert singer Irene Schachinger, daughter of the painter Gabriel Schachinger, and five joyous years followed. Their son Falk Volkhardt was born, and the Bayerischer Hof – now with state-of-the-art facilities following its modernisation – soon became highly popular among the rich and famous. Then the Great Depression set in. Adolf Hitler and the NSDAP came to power, and once again Hermann Volkhardt was faced with the loss of his hotel. The Nazi party wanted to buy it as a “guesthouse for prominent visitors of the NSDAP”. But the hotel’s owner stood his ground this time too, and the Bayerischer Hof remained in his hands. When the hotel was destroyed by aerial bombing during the night of 24-25 April 1944, it looked like all hope was lost. But Hermann Volkhardt never lost faith in the future and proclaimed: “We shall rebuild the Bayerischer Hof to be more beautiful than ever before.” Just a short while later, the now 19-year-old Falk Volkhardt returned to the Promenadeplatz, wounded, from a military hospital. Like his father, he too had no intention of giving up the Bayerischer Hof. Once the war was over, he began to probe the ruins of the former grand hotel along with three old staff members. Beneath the mound of rubble they made an incredible discovery – the Spiegelsaal had survived almost intact. Swift work followed, and on 22 October, 1945 Falk Volkhardt opened the Spiegelsaal as the first restaurant in the centre of Munich. This event – which saw film stars return to the Bayerischer Hof like in old times – made an impression. Even His Eminence Cardinal von Faulhaber, impressed by what the Volkhardt team had managed to achieve, asked whether the gentlemen might be able to come and repair his windows at home. Once a bar had been set up over the debris – a very chic bar for the times – it was the turn of the first staying guests to return. At first, they had to be satisfied with seven unheated rooms, wrenched from the ruins at great effort. But slowly the number of rooms increased and a small entrance building on Promenadeplatz was also built. June 20, 1948 was the date set for currency reform. Since each guest could only get their deutschmark allocation in their home town, the hotel emptied at a stroke. But a few days later the first guests returned and were suddenly able to buy any product under the sun with the new “good” money. It was money that the Volkhardts didn’t yet have. Despite selling the family jewellery, they still needed to invest large sums in the reconstruction of the hotel. Although the number of rooms was steadily growing, the Bayerischer Hof soon found itself bursting at the seams. At the 1949 Oktoberfest, when there were already 74 rooms, guests had to be put up several to a room. And a year later, when the first Oberammergauer Festival was held, even bathtubs were turned into beds. 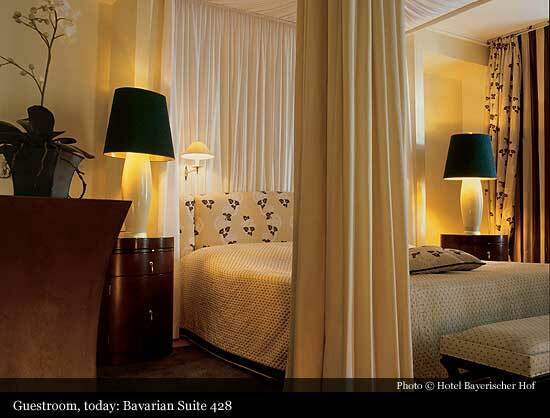 By 1951, however, the Bayerischer Hof had 250 beds and the first conferences were held in the new function rooms. On the annual balance sheet for 1952, the hotel recorded a formidable 100,000 overnight guests. This was reason enough to be pleased, but Falk Volkhardt had higher ambitions for the Bayerischer Hof, which still belonged to his grandfather’s three sons. When his father Hermann Volkhardt died in 1955, he inherited his share, but this came with an obligation to pay a legacy to the siblings. Another four years passed before he was able to pay off the family and all sharers in the inheritance. So, in 1959, the Bayerischer Hof passed into the hands of the third generation, with Falk Volkhardt becoming the sole owner. To realise his visions for the hotel, he had to borrow heavily once again. But it was a risk that soon paid off. Within two years, Falk Volkhardt had restored the Bayerischer Hof as the dominant building on Promenadeplatz, with seven storeys and a 71 metre long facade. He acquired the last plot that still remained between the “Palais Montgelas” and the old hotel, at Promenadeplatz 4. And he had a swimming pool built on the roof, which could even be transformed into an open-air pool in good weather – it was a sensation. Added to this were the “Die kleine Komödie” theatre with 600 seats, and the banqueting hall with two galleries. Now that there were three restaurants, shopping arcades, and rooms, apartments and penthouse suites to cover all possible requirements, the hotel was able to offer the highest standard of facilities to more than 3,000 guests. The Bayerischer Hof was once again a grand hotel. In 1962 Falk Volkhardt married Erika Spranger, who gave birth to daughters Michaela and Innegrit. In the years that followed, Falk Volkhardt set about trying to buy the neighbouring “Palais Montgelas” from the Bavarian state. This called for long negotiations, but in 1969 the deal was done – the protected monument and sumptuous classical palace was transferred into the ownership of Falk Volkhardt. Although he had to dig deep in his pockets to pay for the palace, which needed extensive renovations, he fulfilled another dream that same year by buying the Hotel Zur Tenne in Kitzbühel. In 1971 the Volkhardt wine cellar business was relocated to Pasing, where the business expanded and the cellars grew. 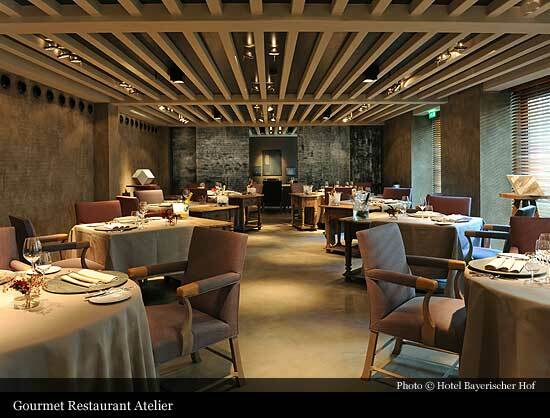 Falk Volkhardt used the space that this freed up to create a truly special restaurant. He brought the worldfamous Trader Vic’s to Munich. The opening of the Polynesian restaurant – attended by numerous luminaries from politics, industry, film and television – was the expression of Falk Volkhardt’s demanding standards. He wanted to be able to offer his guests the perfect choice to match every taste. And hence, naturally, the native cuisine also wasn’t forgotten. In the Palais Keller, built in 1425 and formerly used as a salt store for the City of Munich, he set up a traditional homely Bavarian restaurant. Ensuring that diversity extended to beyond the dining opportunities, Falk Volkhardt commissioned the set designer Rolf Zehetbauer to create two unique suites – the Paradise Island suite and the Paris suite. The Palais Montgelas was completed in time for the opening of the 1972 Olympic Games in Munich. 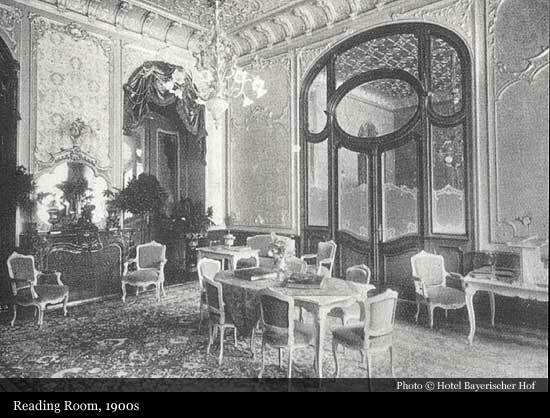 The historic halls and salons now served as hotel suites, conference and function rooms. After a two-year restoration project, the Palais Montgelas became yet another historically rich adornment to the hotel. 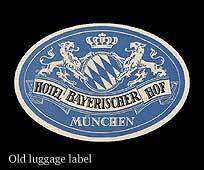 It was also perhaps a reason why, in 1974, the Bayerischer Hof became a member of the prestigious association “The Leading Hotels of the World”, and the first German hotel to be one of the “Preferred Hotels and Resorts Worldwide”. The generation that would take over from Falk Volkhardt came of age in the 1980s. His daughter Innegrit took an apprenticeship in hotel management, completed numerous placements at leading Hamburg hotels and attended the Heidelberg college of hotel management. Having already gained a hotel management degree, in 1989 she decided to take a further degree in business management. Parallel to her course, Innegrit Volkhardt for the first time became involved in the management of the Bayerischer Hof. Displaying a love of detail, she renovated and designed the new rooms together with famous architects, pursuing a number of different stylistic directions. She also realised her idea of staging international jazz concerts in the hotel’s Night Club. However, before Innegrit Volkhardt took over the hotel a number of special honours were still in store for Falk Volkhardt. In 1991, commemorating the 150th anniversary of the Bayerischer Hof, he was named the Service Management Award “Hotelier of the Year”. 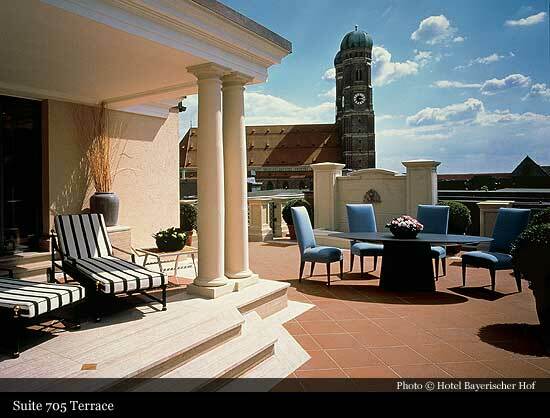 A year later, his hotel won the Goldener Schlüssel guide’s “Hotel of the Year” award. Shortly after these successes, faced with declining health and in keeping with the family tradition, Falk Volkhardt handed over the Bayerischer Hof to the fourth generation. Daughter Innegrit became General Manager in 1992, and in 1994 Managing Partner of a hotel that today employs 670 people. She rose ably to the task. As well as organisational reorientation to develop into a forward-looking enterprise, Innegrit Volkhardt also initiated a ten year plan for the complete renovation and modernisation of the Bayerischer Hof. Innegrit Volkhardt will successfully complete her plan in 2004 with the refurbishment of the swimming pool on the roof of the building and the accompanying expansion of the hotel to create a large-scale health and fitness centre. Incidentally, the Bayerischer Hof isn’t the only hotel to benefit from Innegrit Volkhardt’s refinements. She also arranged for the complete renovation of the Hotel Zur Tenne in Kitzbühel in 1995. Three years after celebrating 100 years in the ownership of the Volkhardt family, in the year 2000 the hotel won yet more awards. The Bayerischer Hof was named “Hotel of the Year” by Gault Millau and “Business Hotel of the Year” by Der Feinschmecker magazine. These were the last awards that Falk Volkhardt would live to see. When he passed away the following year, Innegrit Volkhardt erected a monument to his life’s work in the Bayerischer Hof. 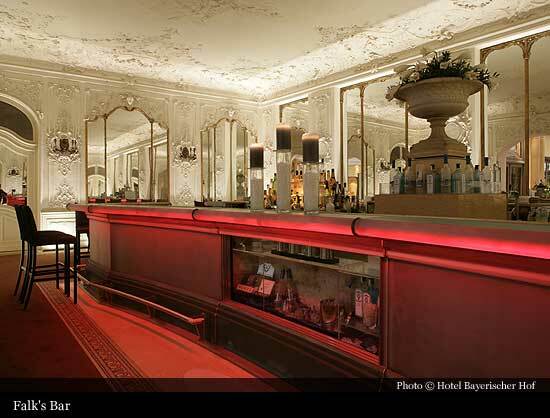 She had the historic Spiegelsaal restored, where she opened falk’s Bar, named in his honour. In 2001 the Bayerischer Hof once again became Der Feinschmecker’s “Business Hotel of the Year”, and Veuve Clicquot named Innegrit Volkhardt “Business Woman of the Year 2000”. This was followed in the next two years by the “Hotel Manager of the Year 2002” award from NGZ Der Hotelier and the “Hotelier 2003” award from Bertelsmann Guide. These successes were also due to the quality standards that Innegrit Volkhardt introduced in 2001. Following the Volkhardt family’s guiding principle that the Hotel Bayerischer Hof should be made ever more beautiful, she will continue to ensure not only that guests enjoy their stay, but that they also feel at home.